D'fhorbair Altram áis nua don chlár SureStart, atá dírithe ar pháistí 2-3 bliana d’aois agus do ghrúpaí eile atá ag obair le pháistí 2 - 3 bliana d’aois - Ca bhfuil Lúlú? Scéal simplí atá i gceist faoi pháistí óga i suíomh lán-Ghaeilge ar lorg páiste - Lúlú. Rinne Trisha Deery na léaráidí dathannacha agus bríomhara don áis seo. Lean an nasc seo le cóip a fheiceáil agus lean an nasc seo le cóip den leabhar amhrán a théann leis an áis a fheiceáil. Altram has developed a new resource for the SureStart programme which is focused on 2-3 year old children and at other groups which are working with children aged 2-3 years old. 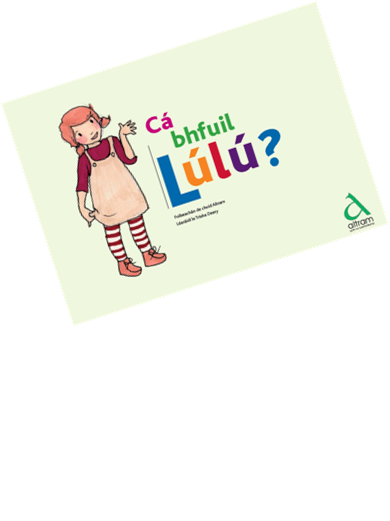 It is a simple story about young children in an Irish-medium setting looking for a child - Lúlú. Trisha Deery did the colourful and lively illustrations for this resource. Follow this link to see a copy and follow this link to see a copy of the song book which goes with the resource. .